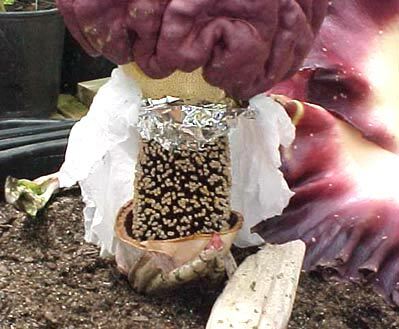 With the foil funnel in place around the base of the male flower zone of the spadix, I wrapped a moist paper towel around the foil collar so that the towel would hang down around the pollinated pistils. The foil funnel prevented the paper towel from contacting the stigmas directly. The humid environment created by the moist paper towel will facilitate the germination of the pollen, and subsequently enhance the pollination.